The 12k of Christmas 2013 | I Quit... Again! 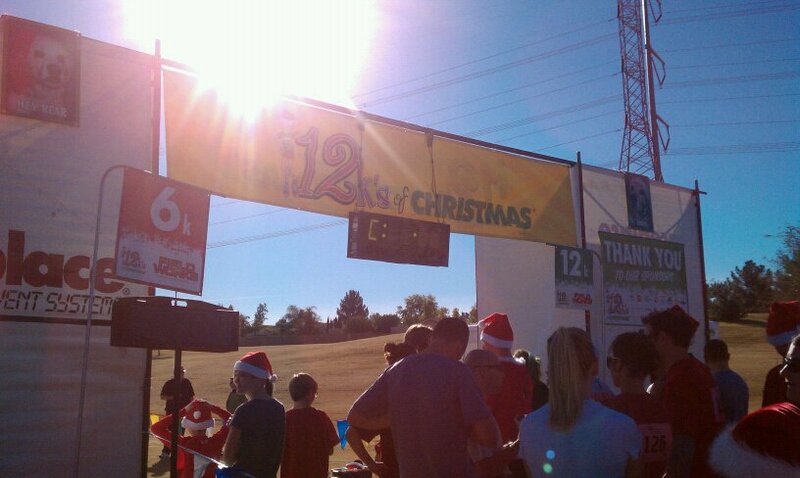 I ran the 12k of Christmas 2010. Well, I ran the 6k option. I remember in 2010 thinking when we (hubby and I) registered that there’s no way that I’m ready for 12ks (7+miles) but later I wish I had tried. This year I really wanted the 12k “Finished” medal. 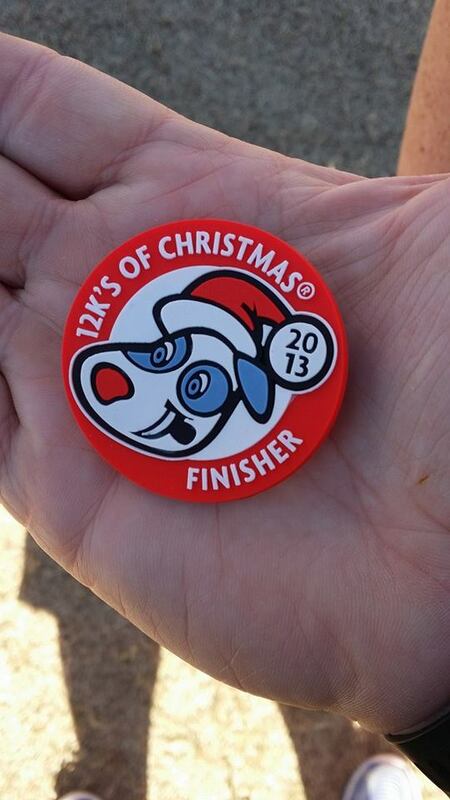 The medal is really just a cheesy, Christmassy pin but it means, hey I did the 12k! 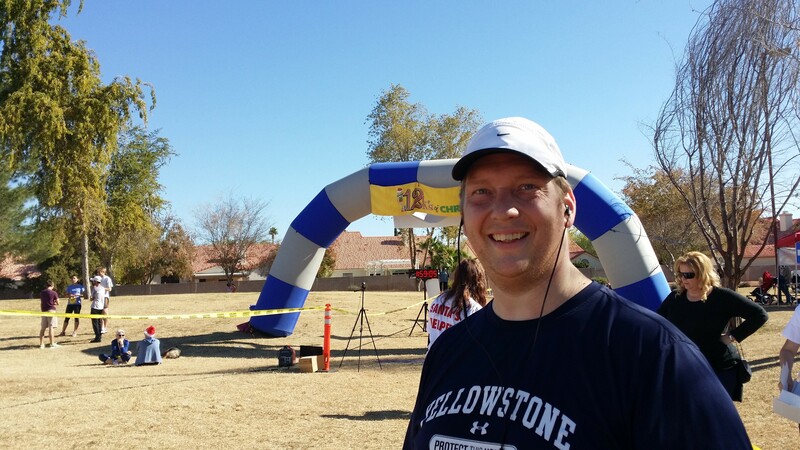 I’ve been really training hard for the PF Chang ½ Marathon in Jan. I’m using the Higdon Half Marathon schedule. My ½ is just 4 weeks away. I have a few races scheduled to get me ready for it; this is one of them. I got really nervous for this race. I didn’t really have a time I wanted to beat but I felt myself putting a bit of pressure on myself knowing whatever time I got I was going to multiply it by 2 and use this calculation as my goal on the ½ marathon. I washed my work out clothes, packed my bag and laid everything out the night before. My husband was so kind as to add his music to my music list. He knew that my music was bothering me during my last race. Music usually motivates me. It gets me into my run. Great music has the ability to make or break me. Dale and I parked. We thought we had a great spot and then found out that the start line was in a different spot from the last time we did the 12k. We walked a pretty good distance to pick up our packets. We then had to walk back to the car to drop off our “goodie bag”. I had a ½ of a cliff bar with some water for breakfast. My last race breakfast hadn’t agreed with me and this is what I had 3 years ago for PF Chang so thought it should be good. I took an Aleve for my shoulder this time. I kept going back and forth; I like to wear a tank top when I run at home but I hate my shoulders exposed so thought I should wear my regular shirt. I know I was way over thinking things but it also was pretty cold. I just could not make a decision for my life. Finally, Hubby reminds me there’s no one here that knows me and I should wear what I’m most comfortable in. He was right. By the time, we went back to where the event is, used the porta potty and at the starting line waiting for it to begin; we had already put over 1.5 miles on our feet. Hubby and I had a few minutes before it began. It was fun to see lot of people out in there holiday festive outfits. This is also an event for raising money for canines so there were some really cute dogs/puppies out this morning too. I don’t really like the beginning of a race. The wait, all the people crowded together, my emotions of the unknown of the race, the pushing and some chaotic stuff when it begins; its not my favorite part. Now I do like the excitement and the rush that hits. But those two things that I like are a major reason my 1st mile is usually too fast.. The guy tells us to go and this race is no different. I know I’m going too fast. I’m keeping up with Hubby and know that’s too fast but the energy of a race at the beginning just pushes and pulls you along. I make a mental note to work hard on this for the next few weeks. I got to keep my first mile in check. We haven’t even gone a quarter of a mile and we have to go up a sandy hill. Then I remember, oh ya this race is lots of rocks and sand. I hadn’t remembered that about this race. This is completely different then my normal runs on my treadmill or thru the neighborhood. I finish my first mile 2 minutes faster than I planned. The next 2 miles are on pace. I feel a bit off. But haven’t put a finger on what it is. My mind is all over the place, I’m more fiddling with my music and fast forwarding everything that plays than concentrating on the race. Why do my legs feel that they are as heavy as lead and I can not move them? Then I see Hubby running and he’s smiling and cheering me on from the other side. I get a lil pep in my step, but its short lived. I’m beginning to think I needed more than that ½ cliff bar and that I should have been more worried about my dinner and water intake last night than my clothes. I see him again and as we cross paths, we high five and I secretly am grateful that I’m actually jogging and he didn’t catch me walking. My 4th mile I hit a wall. The mean MapMyRun lady speaks in my ear that I’m a whole minute slower this mile than planned. I try my first GU ever; raspberry; very yummy, very sweet. It’s so sticky. I only take like a quarter of the packet. I don’t want those calories. I see Hubby for what I know is the last time till the end of the race. He looks like this is so easy for him. I think about why I do this. I think, hmmmm, maybe I’d like to do a marathon one day, what about a triathlon? Look at these carolers giving up their day to sing and cheer us on. What’s Zander going to be when he grows up? What does Lexi want for Christmas? Is Aiden ready for Kindergarten? Am I ready to have all 3 homeschooled? What would happen to them if I died? TEARS I miss my dad! TEARS Why do I get so emotional during a race? The nice lady in my ear tells me I’ve been on pace for the last 2 miles. One more to go… I plan to run the whole last k. I can’t find the sign. I asked a girl at the water station and she tells me I missed it. I start to run and cross the road. Oh there it is. ERRRRRR I feel like I hit another wall.. Dang it!! I should have just drank that whole GU. 100 calories? I was worried about 100 calories when burning 700+. My mind must be not clear. Where’s Bruno Mars when I need him? Then I see him! Dale! Waiting for me. He’s come back to run the last bit to the finish line with me. I can do this! We can do this! Together! The sight of the finish line always makes me go faster. It always makes me smile. It always produces within me great emotion. This race is no different. Looking back I wish I had told my body to shut up more and I wish I had done better, but just like the 6k in 2010 I had wish I had done the 12k, maybe I’ll never be satisfied. But at least I finished the 12k…. OH YA!! I finished!! Where’s my dang finisher medal? What was that? Huh? I’m sorry what did you say? I’m not quite understanding….. You ran out of finisher medals?!?!? Yup! That’s right! I still don’t get that dang medal. They didn’t have one for me. When’s my next race? If I can do it… then you can (be impressed with me) too!